We are Question? We are Creed? Who is afraid of change? A clue to the Pope's resolve? Lord, to whom shall we turn? Fine and thanks, but what do you want? With all the talk of various discussions and debates surrounding the rumoured motu proprio on the use of the 1962 Missale Romanum, Jeff Ostrowski had a thought that he wished to propose to the readership of the NLM. "Why don't you just write to him [Benedict XVI]. The Holy See keeps tabs on the number of letters they receive." We need to realize this. I heard from Rachel Martin, the pleasant NPR reporter who is handling the Indult piece (incidentally, it looks like she specializes in religious stories) and she says it will probably air sometime this week, but she does not know exactly when. She should be able to provide more information sometime soon. You'll all be the first to know, trust me. An interesting article in one of Canada's national newspapers, The National Post includes the article, Latin's second coming. This article is of particular interest as it details one of this paper's writers, a Jewish woman, invitation to a Mass in the Latin language. She relates this to her own background in the synagogue and the use of the Hebrew language for prayer and makes a defense of the use of languages like Latin or Hebrew in liturgical worship, and its potency as well as liturgical value. Pay attention in particular to the last three paragraphs on page one. Oct. 31 (CWNews.com) - Cardinal Dario Castrillon Hoyos (bio - news), who has resigned as prefect of the Congregation for Clergy, will remain president of the pontifical Ecclesia Dei commission, the Vatican has confirmed. Cardinal Castrillon Hoyos, who at the age of 77 is two years beyond the ordinary canonical retirement age, will be replaced at the Congregation for Clergy by Brazilian Cardinal Claudio Hummes, the Vatican announced on October 31. But the Colombian cardinal will remain at the helm of the Ecclesia Dei commission, which is responsible for Vatican outreach to traditionalist Catholics. Father Ciro Benedettini, the deputy director of the Vatican press office, assured reporters that Cardinal Castrillon Hoyos will continue to head the Ecclesia Dei commission for the immediate future. The presidency of that commission is not linked to the leadership of the Congregation for Clergy, and in light of the intense discussions currently taking place about efforts to revive the traditional Latin Mass, Pope Benedict has ample reason to want continuity in the post. Pope John Paul II (bio - news) named Cardinal Castrillon Hoyos to head the Ecclesia Dei commission in April 2000, and gave him the sensitive assignment of negotiating with the traditionalist Society of St. Pius X (SSPX), seeking to end the split that began in 1988 when the late Archbishop Marcel Lefebvre was excommunicated for ordaining bishops to the SSPX leadership without Vatican approval. Formed in the wake of the Lefebvrite schism and excommunications, the primary duty of the Eccelsia Dei commission is to heal the wounds inflicted by that schism, by working to bring separated traditionalist Catholics back into the Church. It is also charged with collaboration local bishops to satisfy the desires for the traditional Latin Mass in keeping with the 1962 rite. Finally, it oversees and regulates those clerical groups and associations associated with the Tridentine rite, such as the Priestly Fraternity of St. Peter, the Canons Regular of the New Jerusalem, and other traditionalist groups. While talks with the SSPX itself have not yet borne fruit, in January 2002 the Vatican reached an agreement that allowed for the reconciliation of another breakaway traditionalist group in Campos, Brazil. And in September of this year a new agreement led to the establishment in France of the Institute of the Good Shepherd, composed of traditionalist priests and seminarians who have left the SSPX. The latter move has roused loud protests within the French hierarchy, which fears the Vatican is going too far to accommodate the traditionalist clerics. Widespread reports that Pope Benedict XVI (bio - news) will soon release a motu proprio allowing wider use of the traditional Latin Mass have heightened the controversy in France, and placed the focus of attention squarely on the Ecclesia Dei commission. Because of his involvement in talks with traditionalists over the past 5 years, Cardinal Castrillon Hoyos looms as an important player in any effort to achieve reconciliation with the SSPX and any new gesture toward traditionalists. The Colombian prelate-- who has said that SSPX members should be welcomed back "with open arms" when they seek reconciliation-- made an important individual move in May 2003, when he celebrated Mass in the basilica of St. Mary Major using the Tridentine rite, thus becoming the first Vatican prelate to celebrate the traditional Mass in a Roman basilica in decades. 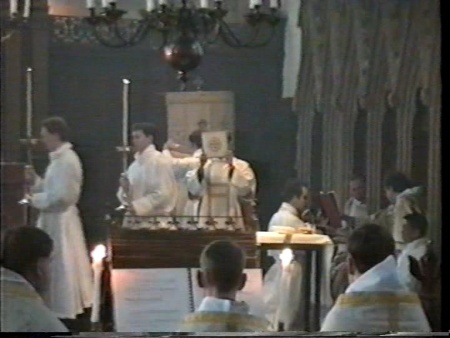 While you're at it, I should note that the same "You-Tuber" has also put on the OMM video of a Solemn Ambrosian Rite liturgy, done in Rome in 2003. This was supposed to be produced, with enough sales at any rate, into a formal DVD. I still hope it happens. Perhaps if people from here go there and place a pre-order, it will still happen. Here is part 1 of 15, but it looks as though all 15 parts are there. If not, they are also available on the web elsewhere, with the whole Mass in its entirety. S. Gregory the Great and His Parents SS. Gordian the Senator and Silvia of Rome. Matthew Alderman. Ink on vellum, begun January 2006 and set aside; completed October 2006. In my family, we were always aware of S. Silvia, my mother's apparent patroness, but it took us a very long time to figure out who she was. Random hagiographic trolling on my part during grade school turned up a S. Sylvia who turned out to be the famous pilgrim Egeria under another name, and whose principal claim to fame besides her journals was her habit of taking cold baths. However, the feast-days didn't match, and eventually, completely by accident, I stumbled on St. Silvia of Rome (November 3, or 5, depending on who's doing the talking), and my saintless mother discovered she'd hit the sanctoral jackpot. You see, Silvia of Rome was Gregory the Great's mom. Mother of Pope St. Gregory the Great, born about 515 (525? ); died about 592. There is unfortunately no life of Silvia and a few scanty notices are all that is extant concerning her. Her native place is sometimes given as Sicily, sometimes as Rome. Apparently she was of as distinguished family as her husband, the Roman regionarius, Gordianus. She had, besides Gregory, a second son. Silvia was noted for her great piety, and she gave her sons an excellent education. After the death of her husband she devoted herself entirely to religion in the "new cell by the gate of blessed Paul" (cella nova juxta portam beati Pauli). Gregory the Great had a mosaic portrait of his parents executed at the monastery of St. Andrew; it is minutely described by Johannes Diaconus (P.L., LXXV, 229-30). Silvia was portrayed sitting with the face, in which the wrinkles of age could not extinguish the beauty, in full view; the eyes were large and blue, and the expression was gracious and animated. Gordianus and S. Gregory's two aunts Tarsilla and Emiliana are also venerated as saints, incidentally. S. Silvia's cultus is sadly largely forgotten at present, but it does crop up in the oddest places--in a small chapel on the grounds of the the present-day San Gregorio Magno, now staffed by Missionaries of Charity, through two worn portraits of her and her husband in the little church of San Gregorio ai Muratori, and there is some evidence that a shingle-style church was built under her patronage at some point in the nineteenth century up in New England, though I don't know either the location or the details behind it. Despite the comparative lack of data concerning the saint's life, there is nonetheless a very charming legend related of her, that proves that even the mother of a future pontiff is still a mother. At her hermitage, she used to tend a small plot of land; every day, perhaps to make sure her monastic son was getting his fill of healthy food, she'd send him a silver plate loaded with vegetables. One day, St. Gregory chanced upon a beggar, and having nothing to give, presented him with the platter. S. Silvia's reaction to this is not on record, but doubtlessly she kept on telling him to eat his broccoli. This image was intended from the beginning as a gift for my mother, and is in a sense a set of variations on the same themes I explored in another portrait of S. Gregory. S. Gregory the Great, Pope of Rome dealt with the Western Church's relationship with the East, while S. Gregory the Great and His Parents is about the emergence of an adult Christianity from the late antique world, and about the continuing Romanitas of that faith. S. Gordianus and S. Silvia had been Christians from birth, not converts, and like virtually everyone else in their day they came from families long familiar with Catholicism. No more potent a symbol is that of Gordianus himself--the Roman senator who taught his son how to be a good Catholic. We see him here, dressed with conscious anachronism in the official toga of the high classical age when perhaps his robes might have been something more stiff and orientally Byzantine, and in him we behold the still-vibrant memory of that civilization carried cautiously, carefully, gratefully, like a flame shielded in a cupped hand against the wind by the Church who had essentially been a sign of contradiction to its pagan antecedents. Gordianus and Silvia made sure their sons were provided with the best fragments of classical erudition that they had to give, and also taught them the Faith that took those scraps of knowledge and revivified them with the sense of meaning that had so eluded the drifting cultic seekers of the late pagan Empire as they floated from Eleusinian mystery to Mithraic rite, and finally to the strange liturgies of an Eastern religion that followed the teachings of someone they called Christ. Gordianus and Silvia, as was sometimes the practice in those days, separated to become priest and nun after their children grew up, and while perhaps not advisable to present-day couples, this act has a certain symbolic potency in this image of transition and transmutation that reminds us of the Romanness of Catholicism that carries within it the baptized distillation of everything good that existed within the pagan, pre-Christian universe, and which, like the Sibyls, paved the way for Christ's coming into the world in the age of Augustus when the whole world was at peace. He is the corporeal father who gives life to a spiritual father, whose spiritual son he is, and who becomes one himself through his own priesthood as the hierarchy of civil pomp is supplanted by one of spiritual self-abasement and humility. Silvia is shown here, as the accounts tell us, a beautiful matron, and imagined here in her bustling, industrious, maternal pre-anchorite phase, very much the woman of the house with her purse and keys at her belt, though perhaps they prefigure as well the keys that her son would bind and loose heaven and earth with, and the gold and silver of his charity that she instilled within him. She is both powerful and domestic, the mistress of six villas, a woman of means and intelligence in an age when the job description of aristocratic housewife meant being a businesswoman, schoolmistress, agriculturalist and, in the worst times, the local civil defense warden against the Huns. Her costume is simple and beautiful, perhaps less self-consciously archaic than her husband's, and in a sense brings her more into the world of St. Gregory and the Middle Ages, the age of meditation and practical mysticism personified by her vegetable platter and her prayer-beads--also perhaps slightly anachronistic, and once again deliberately so. She becomes the image of Mother Church that her son protects and, to draw out a Trinitarian and Marian analogy, the Church from which is born from as his Mother, and who he himself is father to through his reforms, writings and pastoral leadership. This is an image about family, and the passage of leadership from one generation to the next, and the indelible impact of parenthood reaching backwards and forwards from history to the future. S. Gregory produced reams of scholarship, the ageless and undying repertoire of the Church's chant, and an example of heroic virtue that will never be forgotten. S. Silvia and S. Gordian, on the other hand, produced Gregory himself. Whose, one may rightly ask, was the greater achievement? As you know, I always like to share interesting titles with the NLM readership as I run into them. It is also worth noting that Baronius Press has come up with a delightful new series, not specifically liturgical, but made up of some wonderful Catholic books. These include the Catechism of the Council of Trent, Cardinal Newman's Idea of a University, Robert Hugh Benson's Come Rack Come Rope (which looks at post-reformation English history from a Catholic perspective) and more. The answer is here: The Federation of Diocesan Liturgical Commissions is really unhappy about the idea of revising Music in Catholic Worship. "It is a matter of immediate concern to the delegates of the 2006 FDLC National Meeting: to reaffirm the importance of the BCL documents, Music in Catholic Worship and Liturgical Music Today, to support the BCL Sub-Committee on Music and Liturgy in retaining the basic principles of these documents in any revisions." ...According to Solesmes it is possible to copyright a symbol in Europe, and they had copyrighted the ictus and episema. However they no longer insist on that, but I am not sure why. So you don’t have to worry about it these days. The CMAA is very pleased to make available this Graduale Romanum for the classical form of the Roman Rite, applicable to the 1962 Missal. The scans are top quality without sacrificing speed, 600 dpi. They were done by expert professionals and so they are far superior not only to other chant images online but even better than the original because the backgrounds are clean and pure white. The image you see above was done from a quick open PDF page within Photoshop. So attention all choirs singing the classical form of the Roman Rite (Tridentine Mass): this is your songbook. Please print, copy, or otherwise use as you see fit. For new rite singers, see the index in the same spot and find your chant in the PDF. All of these are permanently archived at the CMAA. Some "new" used books: Latin Liturgy of the Hours, Cath.Encyc. set, Gothic architecture, Eastern Christian, liturgical, etc. Description: The Latin edition of the "Liturgy of the Hours", or post-conciliar breviary in use by most priests today. The condition is very good, and the set was owned by a Cardinal. Other than his signature in the front end paper, the volumes are clean, ribbons there, etc. Very nice. 1913 Edition, 16 vols. Complete. Description: This is actually the nicest binding of the Catholic Encyclopedia I've seen, with black leather (or leather like at any rate) spines with the raised bands and gold embossed text. The corners of the covers are similarly bound in this black leather material, with a deep green cloth being the rest of it. The only caveat is the vols 1-15 are from this set, but the Index volume is actually from another deep=green cloth set. However, if you had to have an odd volume, it would be the index, and fortunately the deep green cloth of that volume is the same as the deep green on the other portion of the covers I described. The set is in good shape. Some scuffing of course, but the bindings are all tight. Marbled end-papers complete the nice touches to this particular set. A very nice edition of these primary offices of the Tridentine breviary (English only) for Lauds, Vespers and Compline. A very good volume for one wishing to pray the traditional Roman breviary. Description: Pretty well the edition you want to own. The books are nice oversized volumes, with deep green binding and beautiful gold-embossed designs on the spine and front cover. The set also includes gorgeous, medieval/renaissance style full-colour plates of a large number of saints throughout each volume. Published around the 1920's or 1930's and still in good shape. Description: a nice, hardcover Tridentine Missal with traditional art inside. Published in the 1930's. Description: You've probably all seen this book. It's the one that includes gorgeous, detailed drawings of the traditional liturgical ceremonies of the Church, including the seven orders, all as part of a catechism for children and young adults. Popular enough to have been reprinted, but you seldom see the hardcover edition in this good of shape. Very, very handy if you're raising your children in the classical liturgical rites. The drawings are extremely attractive and inspiring to adults even. Description: Another liturgical classic. The cover is a little worn, but otherwise good. Description: Also from the Liturgical Studies series. Very good shape, hardcover with dustjacket and mylar cover. Description: Von Hildebrand's post-conciliar account. Clean paperback copy in extremely good condition. Rare find. Longmans, hardcover. A rare find in extremely good condition. The Pro Multis translation controversy which appears about ready to break--or be resolved, perhaps--is really not my issue, but I do realize it's a Very Big Deal, and so, without further ado, I leave you in the competent hands of Fr. Z, whose Very Important News on the subject was pointed out by alert reader Diane. So I got interviewed by NPR today. Really. It's about time I had a shot at it. What happened was NPR sent a little news team down to St. Agnes on 43rd Street to do a parishioner-in-the-street interview. And I was the parishioner. This is another bit of evidence that Indult Fever is verily and truly upon us, and it's not merely a wee rumor percolating within the blogosphere. Also, this actually is pretty old hat for me--the top of my head was in a crowd scene on a local Tampa news channel when I was 12. So I know all about showbiz. Why me? Or, since Dawn Eden got interviewed as well, and Andrew Cusack was there too, why us? I don't know if we stuck out, well, that much. The crowd at St. Agnes is a little bit older than I've seen at St. John Cantius in Chicago or the other St. Agnes, the one in St. Paul, but there's still enough young folks and families with kids to be worth commenting on. More interesting is the fairly sizable number of middle-aged Tridentinists; truly the lost generation when it comes to these circumstances. Dawn Eden, Andrew Cusack, my friend Joel, and our mutual friend Drusilla, and I were young and also conveniently in the closest clump to the reporter and her microphone-bearer. So I started pontificating into the recorder. I'm not sure what bits they'll splice out as their soundbites, but I gave them, in capsule form, a little run-down on what the old rite means to me, and what I thought Benedict was trying to do with the indult. I explained that I alternate back and forth between a Novus Ordo parish that does a tradition-minded mass in mixed English and Latin, and the Tridentine Rite, and that I benefitted a lot spiritually from both forms of the mass. The reporter was especially curious about what in particular I got out of it. The old Mass, I responded, was something which was most rewarding after continual rumination and meditation. Not everything was perceptible on the surface, and that while it might seem confusing or foreign at first glance, it was a ritual and a form of prayer you could come back to again and again to find fresh meaning within the same sets of words and gestures. "So it's more meditative and thought-provoking?" Yeah, pretty much. I said it was possible to participate in a very overt way by chanting the responses, and that Catholics had been encouraged to know basic chants both before and after the Council, and that an inner participation, one of listening, was another valid way of praying the Mass, and an essential component of our outward active participation no matter what we do. Given the way media coverage has focused on the indult from the nostalgia angle, that it was important to not just chalk this up to schismatics and old people, but that it was a way of re-connecting with the past that would impact both those attached to the Traditional Rite and those in the mainstream. In other words, the spirit of reverence embodied in the Tridentine mass would, one hopes, trickle down into more ordinary forms of liturgy as well. I enlarged on this theme, commenting that the numerous young 'uns I know who would be likely to hang out at St. Agnes don't see the whole Old Rite/New Rite, Vatican II/Tridentine business as a matter of either/or. It's possible to be a "Vatican II Catholic" and still love the old rite; Benedict and all the popes before him have said time and time again that Vatican II did not wipe the slate of history clean, and that its decrees always had to be interpreted in light of tradition. Dawn, as a neophyte newcomer to the Latin Mass, proved, as one would expect, very pleasantly articulate as she explained her experience to the reporter. The immediate genesis of her visit had to do with a run-in a few weeks earlier with a loosy-goosey Mass she'd run into at a church that had suffered a bad wreckovation some years back. Understandably, the solemnity and tradition are the ultimate antidote to liturgical purple shag carpeting, and she wanted to be reminded once again of the transcendent heavenly realities we so often miss amid our modern liturgical abuses. Dawn also made the point we didn't know all this stuff by heart, that we had missals! And she pulled out the little red booklet she'd picked up earlier at the bookstore, the omnipresent and ever-handy Ecclesia Dei reprint that I've seen sitting on pews everywhere from South Bend to Rome. Which made me chuckle, not at the NPR crew, but at myself for assuming everyone knows everything I do. This explained the earlier question of the reporter, whether I knew Latin; I'd never thought to explain we Catholics have our time-honored tradition of book-length liturgical cheat sheats! So we both survived our brush with the press--and a very polite and thoughtful press it proved to be. I admit I was a little skeptical at first. There's the question of how to make this stuff alive to the folks outside the wonderful world of Catholic Nerddom. And I'm always a little leery about getting put on tape. Maybe it's that I don't like the sound of my voice--everyone assumes in their head that they're James Earl Jones and are always shocked when it comes out on the Camcorder like Mickey Mouse--maybe it's the result of a bad experience with a rogue answering machine. But it all worked out well. Anyway, check out NPR tomorrow afternoon and see what choice snippets they got out of my sidewalk pontification. I found the whole experience to be a remarkably pleasant one, with the reporter being very open and understanding to my remarks, and very happy to have stumbled across someone who knew, so to speak, the rest of the story. I'm grateful that NPR thought enough about what one might suppose would be a story buried on the figurative back page of the soundwaves to go out and find some folks to talk to and get the real deal about a matter of faith that isn't always well-received these days. And I always love pontification, In a good cause, of course. In St Peter’s Square, on a sunny day reminiscent of summer, the Latin text of the Angelus prayer was shown on maxi screens for the first time, to enable the faithful present to pray the words together with the Pope. "One thing above all should always be remembered, in 2006, and for as long as this post-Conciliar crisis will last, namely that it consists in a war to the death between two directly opposed religions: the Catholic religion centered on God, and the Conciliar religion centered on man and the modern world. The Conciliar religion is a diabolically skilful counterfeit of the true religion. Between these two religions, as such, there can be no peace until one of them is dead... that is why, thirdly, Conciliar Rome recently approved of the semi-Traditional Good Shepherd Institute in Bordeaux, France, not because it is Traditional but because it is semi-, in order to draw SSPX priests and Catholic faithful away from the up till now fully Traditional SSPX, which, precisely because it is fully Traditional, Conciliar Rome must dilute or dissolve." "They [the Church] must, clearly and unambiguously, denounce the Second Vatican Council and renounce their false Conciliar religion." Sadly for Williamson, the Holy See represents "false religion". Williamson's thought is very much a part of a hermeneutic of rupture that the Holy Father has condemned. We are accustomed to thinking of this mainly in progressivist terms, but it also effects the radical, or hardline, traditionalist movement. But it must be remembered that there are two forms to this rupture: those for whom the Church begins only after Vatican II, and that which comes before is jettisoned; and those for whom the Church effectively ended at Vatican II, excepting of course in their own circle who share their vision. This leads to the talk of "Eternal Rome" vs. "Conciliar Rome" (a false dichotomy), but the Church is indeed a seemless garment. While one can acknowledge problems, crises and issues existing after the Council, we must distinguish these particular situations from the divine protection promised to the Magisterium of the Church. With such thought as Williamson's so publically out there, is it reasonable to think that the Holy Father's aim with a universal indult is the corporate return of the SSPX? Is a liberalized usage of the 1962 Missal simply an olive branch for the SSPX? Certainly this is part of it, but for the Holy Father, this issue goes beyond the SSPX I think. He will be well aware of these extreme factions of the like of Williamson. He might also hope, as we do, that there might be more moderate factions for whom this will help bring them back into full communion. The Holy Father is not trying to bribe the SSPX. For the Holy Father, the matter is also, I believe, a deeper issue which relates to his concern over the way the post-conciliar reform was handled. His view is to help both the classical liturgy as well as the reform of the reform. As well, from Williamson's comments, it should be crystal clear that even a full liberalization of the 1962 Missal, for such folks, would be viewed with suspicion, even conspiratorial terms, and as ultimately insufficient. We all hope and pray for the reconciliation of the SSPX and for a return to their communion with the Church. But this very vocal element within the SSPX further demonstrates why the question of a universal indult is not merely reducable to an issue of appeasing the SSPX. As such, we should neither underestimate the depth of the problems to be found within the SSPX, nor should one underestimate the depth of the scope and intent of such a liberalization of the 1962 Missal. It would be in view of the whole Church, and not merely with relation to the SSPX question. I'm very pleased to post the table of contents to the forthcoming issue of Sacred Music, Winter 2006, due out in a few weeks. Years ago, I was discussing music with a parishioner who attended the "contemporary" music Mass, and (no surprise) I mentioned the glories of chant (why must I do that?). Her response was honest but tough to take: "I find chant so depressing. Christianity is about joy." Of course my first reaction is to bristle up like a porcupine but there is no sense in taking issue with someone's subjective impressions. Chant either helps her pray or it doesn't, and if she finds that that it depresses her, am I suppose to argue her out of that position? What that conversation did do, however, was bring about a certain alertness to the requirement that singers do their best to convey joy within the chant tradition when it is appropriate to do so—not in the same earth-bound, yippee way that contemporary pop music does but in a manner that points to transcendent joy, infused with the mysterious awe that comes from reflection on the final victory over death. We begin with rejoicing, not the usual intonation of a few notes but one that is long and melismatic. Economy is given up in favor of extended exuberance. The schola joins by picking the phrase and taking it to its highest point in the middle of the word salvation. Immediately, the listener knows the theme, even if the text were not the there. The name of the Lord follows with two successive affirmations of the Trinity. We end with this wonderful phrase on "magnificabimur" in which the last syllable seems to wait and wait until the last possible moment. The "mur" here recalls the initial "mur" in laetabimur. Joy and pride in our God! Different chants require subtle changes in tempo but it strikes me that this one should be sung on the faster end of the metronome. Timing it out with this online metronome, I might suggest about 184 beats per minute for the punctum—which is quite fast, faster than the adult heart pulses during strenuous exercise but on the upper end of a child's pulse after bounding around the yard in sheer love of life. The same sense is conveyed here in a contained and upward looking way. This is the song of salvation. Learn it for Sunday and you will carry it in your heart all week. Here is a version you can print and learn, with Psalms. 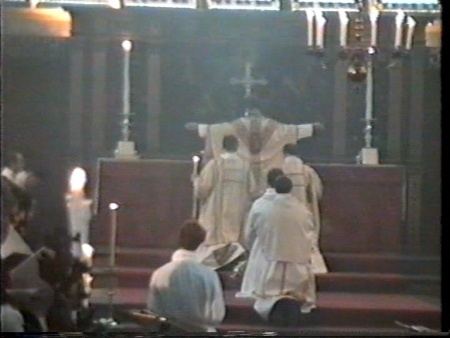 I was recently watching a DVD of the Sarum Use liturgy that was celebrated under Catholic auspices (Fr. Sean Finnegan) at Merton College, Oxford, in the late 1990's. Fortuitously, they recorded this event. I took a few DVD stills from the DVD to show those on the NLM who I know will be interested. I will make a few comments on some of the variations from the Roman rite, but I will not claim to be (yet) intimately knowledgeable of all the details of this use, nor how this solemn Mass might vary from a more standard Sarum use liturgy. If we have people here who are more knowledgeable, please chime in for all of our benefit, and feel free to correct anything that may need it. One will also notice above another mediaeval feature. On the altar are two altar candlesticks instead of six. This seems to have been the more common practice in the mediaeval Latin liturgy. Witness to this fact are the numerous manuscript illuminations which show this arrangement. 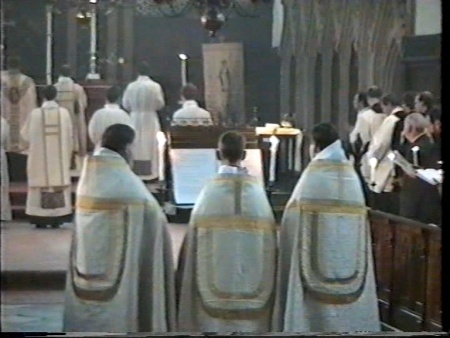 A unique feature as well in the above are that the schola are dressed in cope. This further shot gives a better sense of the sanctuary. What I found interesting here is that the acolytes and crucifers still remain standing in the midst of the sanctuary for this part of the liturgy. 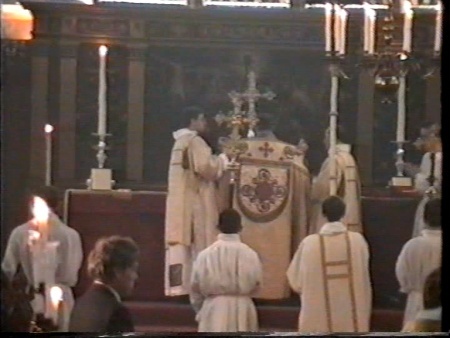 Above: The burse with the corporal inside are taken to the altar, led by the two acolytes. 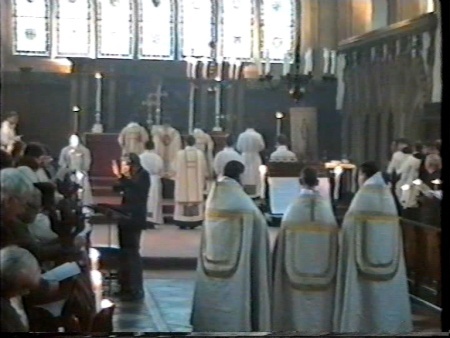 Above: as is the case in the Rite of Braga and the Ambrosian rite (possibly others) after the consecration, at certain points of the Canon, the priest raises his arms in cruciform fashion. It is a powerful reminder of the sacrificial nature of the liturgy and as well a potent tie-in of the unity of the sacrifice of Calvary with what is taking place in the Mass. 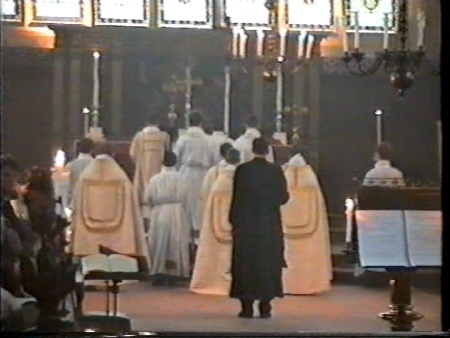 In this photograph as well, one will note that the deacon and sub-deacon carry lit tapers. One will also note, in addition to the priest, there are 4 sacred ministers rather than 3. In preparation for the recessional, the various ministers and servers are lined up set to be led by the verger. The verger can still be seen in Anglican worship, but this was the first I had seen the verger used in Catholic worship. It would be interesting to study further the history of the verger and whether his use was particular to Catholic England. Oct. 27 (CWNews.com) - The prefect of the Congregation for Divine Worship spoke out sharply against liturgical abuses during an October 26 presentation in Paris. Speaking at the Catholic Institute of Paris, Cardinal Francis Arinze (bio - news) decried the "banalization, desacralization, and secularization of the liturgy." He rebuked priests who take an "overtly egocentric" approach to the liturgy, violating the norms of the Church. And he also criticized priests whose "false humility" leads them to "share their role with the laity." Here is a 5-page listing of the Propers of the Church Year according to the 1974 Graduale. I've not seen anything else like it available online. It is in Beta for now. Any volunteers to take it to the pre-release stage? Comments and questions go to the author. Oct. 26 (CWNews.com) - The president of the French bishops' conference is in Rome this week, meeting with Vatican officials to discuss relations with traditionalist Catholics and the prospects for a new document allowing broader use of the Latin Mass. Cardinal Jean-Pierre Ricard of Bordeaux met with Pope Benedict XVI (bio - news) in a private audience on October 26. Earlier in the month he had said, in an editorial published in his archdiocesan newspaper, that he planned to travel to Rome to ask for "completementary information" about the Vatican's approval of a new traditionalist religious group, the Institute of the Good Shepherd. Seán Patrick Cardinal O’Malley: Last Sunday, I had the pleasure of participating in the 125th Anniversary Celebration of St. Bridget Parish in Maynard. It was a beautiful experience. I was quite impressed by the fact that the Choir did a lot of polyphonic music, which one doesn’t hear too often. They performed many beautiful Latin Mass arrangements. I think that for a festive occasion like that one, the parish enjoyed very much hearing those special arrangements. Obviously it meant hours and hours of practice on the part of the choir prior to the Mass. It was apparently a labor of love for them. You may not be familiar with polyphonic music. It is harmonized music. The old four part Masses featured much polyphonic music and it was very prevalent in the 15th and 16th centuries. It’s quite beautiful. It’s close harmony…sort of like a barbershop quartet, but in Latin…LOL! [Sorry for the quiet today folks. I've been away until now. As for this story, this opposition is surely no surprise. However, opposition is not strictly a reason to not forge ahead for the sake of the greater good and longer term end. Unfortunately, the ideas expressed in the quoted portions of this article are quite problematic. First off, we must be realistic: it is quite resasonable to propose that there have been significant problems in the implementation of Vatican II, and thus can one really make this into an issue of being loyal to Vatican II"? Whom and in which particular matters is one or isn't one being loyal to Vatican II? The question is not so simplistic as adhering to the Pauline liturgy = loyalty to Vatican II, and adhering to the Tridentine liturgy means one is disloyal unless we presuppose a reasonably proximate implementation of the Conciliar decrees -- something not presupposed in even the highest levels of the Church. Second, the issue isn't as simplistic as the SSPX and their appeasement. It goes beyond this to those in full communion with the Church. In this regard as well is the former characterization about conciliar loyalty neither accurate, nor particularly charitable. Third, as regards the issue of a multiplicity of rites; while indeed this scenario is not precisely the same as our different rites and geographical uses, nonetheless, there has been and still is a multiplicity of rites within the Church. Thus to argue that this would be contrary to unity seems quite untenable -- and again, more representative of ideological issues. There is an intolerance in this matter I believe, and it is an intolerance which has not served the Church well, either in this case, or in others. We need to move beyond it and beyond a sense of singular Roman liturgy. Oct. 24 (CWNews.com) - French clerics are leading the opposition to release of a papal document that would allow wider use of the traditional Latin Mass. A group of 35 French bishops and priests have issued a statement urging Pope Benedict XVI (bio - news) not to issue the motu proprio that has been widely discussed in recent weeks. The clerics predict that by allowing broader use of the Tridentine rite, the papal document would "plunge us back into the liturgical life of another age." Infocatholo, the news agency sponsored by the French bishops' conference, reports that the papal document has been edited and is ready for release. But the bishops' news agency says that there is strong opposition to the proposed move within the Roman Curia. Opponents of the Latin Mass have based their arguments on the premise that the Pope's proposal would be designed to encourage members of the traditionalist Society of St. Pius X (SSPX) to return to communion with the Holy See. Bishop Claude Dagens of Angouleme told the weekly La Vie that a change in liturgical discipline would not achieve that result. He explained, "You can't pretend that Archbishop Lefebvre's break with the Church was caused only by the liturgy." 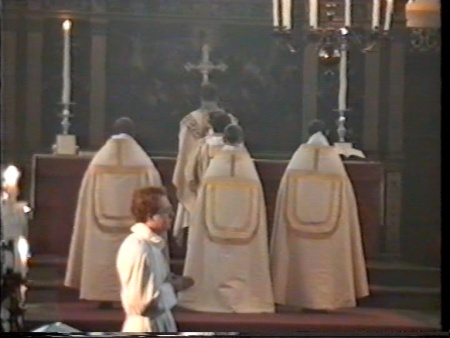 But other French bishops objected to use of the old liturgical rite by priests who have left the SSPX, to set up the new Institute of the Good Shepherd. Archbishop Andre Vingt-Trois of Paris complained that the new Institute, with Vatican approval, has already begun work in the Paris archdiocese. And Bishop Michel Pansard of Chartres said that he was "astonished" to learn that the traditionalist group was opening a seminary without first consulting him. Infocatho, the bishops' new agency, gave a clear indication of its own perspective in the news report on the French clerics' complaints. The adoption of a policy allowing free use of either the Tridentine liturgy or the post-conciliar Novus Ordo, Infocatho said, would divide the Church, because "Eucharistic bi-ritualism in the Latin Catholic Church contradicts what the Eucharist signifies." Amy Welborn has a post up about the word that Pope Benedict XVI has decided to end the indult which permitted Extraordinary Ministers of Holy Communion to purify the sacred vessels. Oct. 24 (CWNews.com) - The publication of the papal document concluding the work of last year's Synod on the Eucharist is "imminent," according to the I Media news agency. Citing informed sources at the Vatican, I Media reports that Pope Benedict XVI will soon release his apostolic exhortation on the Eucharist. The Holy Father reportedly was reviewing a final draft of the document late in August. The imminent release of a papal document on the Eucharist would be noteworthy under any circumstances. But in light of the reports that Pope Benedict is preparing another document on the use of the Latin Mass, the document will be even more anxiously awaited. Some Vatican-watchers have surmised that the Pontiff will release his motu proprio on the Latin Mass in conjunction with the apostolic exhortation on the Synod. The members of the bishops' committee charged with drafting a document on the Synod discussions, which the Pope would use as the basis for his apostolic exhortation, met in Rome early in June. At that time the Pope had expressed a desire to see the document soon, and wrap up the work of the Synod on the Eucharist. He apparently worked on the document during his summer stay at Castel Gandolfo. The informed Vatican sources cited by I Media say that the papal document will be quite similar to the list of final propositions endorsed by the Synod fathers after concluding their discussions in Rome last October. In a break from ordinary Vatican practice, the Synod released that list of 50 propositions in an "unofficial" Italian-language statement last October 22. The "official" Synod conclusions, in Latin, were given to the Holy Father. Pope Benedict, respectful of the collegial authority of the Synod, has made relatively few changes to the text approved by the Synod fathers, sources report. Meanwhile the ordinary council for the Synod met in Rome earlier in October to prepare a working document for the next full meeting of the synod, scheduled to take place in Rome in October 2008. The subject will be "the Word of God in the life and mission of the Church." The Synod council is now working on the lineamenta, the first working document for the Synod discussions. Once that is complete-- with a final document expected to be approved by the Synod council in January 2007-- the lineamenta is circulated among the world's bishops for their comments. On the basis of their suggestions a new document, the instrumentum laboris, is drawn up to serve as the basis for the Synod discussions. The speech by James MacMillan, the pre-eminent Scottish composer, is now online. It received vast attention at the time it was given but the press reports didn't convey the full extent of his research and understanding. One can quibble about some characterizations but given what a minefield he has ventured into here, this is a wonderful speech overall. In recent times the Church has developed uneasy relations with its musicians. Growing up in the 1960s and 70s I was aware of a creeping separation between my serious engagement with the study of music, the application and practice of assiduously honed skills, and what the Church seemed to need and want for its liturgy. I soon discovered that most serious Catholic musicians were being repulsed by an increasingly rigid misinterpretation of the Second Vatican Council’s reforms on music. Clergy and "liturgists" began expressing a scarcely veiled disdain for the very expertise and learning that musicians had sought to acquire. Serious musicians were more and more caricatured as elitists, reactionaries and Tridentinists by a new philistinism in the Church. Many of those who were not subdued into a state of quietism defected to Anglican and Lutheran parishes where their skills as organists, choral directors and singers were greatly appreciated. These other churches now regard the Catholic Church as having engaged in a cultural vandalism in the 1960s and 70s – a destructive iconoclasm which wilfully brought to an end any remnant of its massive choral tradition and its skilful application to liturgical use. In short, music in the Catholic Church is referred to with sniffs of justified derision by these other denominations which have managed to maintain high standards of music-making in their divine services. FULL ARTICLE . And here is an active thread at Amy Welborn's blog. CIEL 2006 Oxford Colloquium. 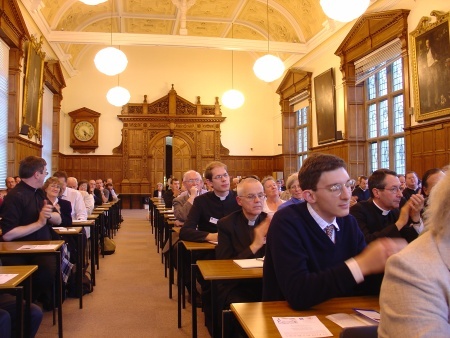 Held at Oxford University, Merton College, Sept. 13-16, 2006. It is the presentation of academic research papers which drive a CIEL Colloquium. It is this which ultimately brings together an international audience of scholars, clergy, religious, lay men and women; people from all walks of life and all manner of vocation, joined by a common bond that is the love of the Roman liturgical tradition and a desire to explore the depths of its riches that it might be better nurtured, fostered and lived. Indeed, if there is one aspect for which CIEL has become known, particularly amongst the hierarchy, it is that of a scholarly and non-polemical organization. This tradition continued in Oxford. A total of twelve papers were given in the course of the Colloquium. Of these, many of the most recognized names in present-day liturgical scholarship were present, men and women whose work is acknowledged and respected amongst various authorities in the Church. As such, the Oxford Colloquium was brought to the very fore of Catholic liturgical scholarship. In addition to the inherent benefit this provided for the gathered delegates, it also brought an opportunity for these scholars to confer and to listen to the work of their colleagues, thus allowing for a potential cross-fertilization of ideas and themes to emerge both during the Colloquium and after it in their own respective work. Present at the Colloquium were, Professor Eamon Duffy (author of The Stripping of the Altars), Fr. Uwe-Michael Lang (author of Turning towards the Lord: Orientation in Liturgical Prayer), Dr. László Dobszay (author of The Bugnini-Liturgy and the Reform of the Reform), M'l'Abbé Claude Barthe (author of Beyond Vatican II), Rev. Dr. Alcuin Reid (author of The Organic Development of the Liturgy), Rev. Dr. Laurence Hemming (of the Society of St. Catherine of Siena and author of numerous philosophical works), Fr. Joseph Santos (an expert in the Bragan rite), Dr. Lauren Pristas (of Caldwell College, New Jersey, and author of studies on the revision of the prayers that occurred in the liturgical reform as well as the Society of St. Catherine of Siena Research Fellow in Liturgical Theology), Fr. Gabriel Diaz (a Russian Catholic priest in Paris, France), Fr. Nicola Bux (a professor in Bari, Italy), Dr. Christina Dondi (of Lincoln College, Oxford) and Dr. Sheridan Gilley (emeritus of Durham University). As mentioned, the theme of the Colloquium was “The Genius of the Roman Liturgy: Historical Diversity and Spiritual Reach.” The papers presented considered matters such as the variety of uses and rites in the historical West as well as the spiritual power of the historical liturgical forms of the Roman rite. More specifically, topics included “Sacrosanctum Concilium and the Organic Development of the Liturgy”, “The Development of the Feast of Corpus Christi and its Place in the Church's Sacred Year”, “Liturgical Exegesis in the Middle Ages: The Mystical Meaning of the Ceremonies of the Mass”, “Poetry in the Latin Liturgy”, “Music Proper to the Roman Liturgy”, “The Early Development of Christian Latin as a Liturgical Language”, “Pope Benedict XVI and the Liturgy”, “Theological Foundations of the Liturgy that are in Need of Restoration”, “Liturgies of the Military Religious Orders”, “The Rite of Braga”, “Roman Liturgy and Popular Piety” and “The Liturgy and Theology”. There were three venues for the delivery of these papers. In the evenings the papers were delivered within the Merton College Chapel. During the daytime hours they were delivered at the University Examination Rooms and on the final day, at the Sheldonian Theatre. All were magnificent venues which aided in establishing the academic tone of the Colloquium. It was impressive as well to see these large venues quite full; a testament to the success of the Colloquium, as well as to the growing interest in CIEL in the English-speaking world, to whom the previous Colloquia had perhaps been less accessible due simply to language barriers. The representation from North America was particularly unprecedented and thus bodes well for CIEL's work and further expansion there. The very first paper given, given Wednesday evening in Merton College Chapel, was that of Eamon Duffy, Professor of the History of Christianity and President of Magdalen College at Cambridge University, titled “Pope Benedict XVI and the Liturgy.” In this paper, Duffy traces the development and evolution of the present pontiff's liturgical thought from his upbringing, through to the turbulent times surrounding the Council, and finally up until present times. Duffy highlights the influential role of the Liturgical Movement and in particular, the thought and writing of Romano Guardini for the young Ratzinger. This had an two-edged effect. On the one hand it brought with it a sense of the central importance of the liturgy, but on the other, it also brought with it some of the more modernizing tendencies of the times, which would result in the Ratzinger of the conciliar era being a critic of the pre-conciliar liturgy. Following the Council, Duffy highlights the change of course that Ratzinger's thought would take upon the radicalization of the ends of the Liturgical Movement, which had shifted away from a balance of prudent reform, conservation and restoration to much more radical and fundamental liturgical change. Ratzinger would understand this to be disastrous and as representing a fundamental betrayal of the work and goals of Guardini and the original Liturgical Movement. Duffy further highlighted that the prohibition of the former missal at the adoption of the Missal of Paul VI was very distressing to Ratzinger, something he understood as unprecedented and as a break with ill effects. This leads us to the present time. The fundamental understanding that Ratzinger has very much relates to the principle of liturgy as something which is received rather than something conceived. In other words, the sacred liturgy is not something we invent, but rather which develops gradually over time, and of which we are servants and caretakers. Further, the liturgy is not a self-centered affair, but is rather most primarily focused upon God. Duffy spends a great deal of time on Ratzinger's critique of the overemphasis upon the “meal” concept of the Mass which many liturgical reformers promoted. From this meal emphasis flowed a number of notions, most especially the matter of the orientation of the priest of the altar, which, after the Council, turned almost exclusively in Mass said “versus populum” -- something Ratzinger is also critical of. Finally, Duffy also touches upon the present pontiff's views of active participation and what that does and does not mean. Fr. Michael Lang, of the London Oratory, at present a Research Fellow at Heythrop College, University of London, gave the second paper of the colloquium the next morning in the splendid University Examination Schools, which are almost directly across the street from Newman's church of St. Mary the Virgin. Fr. Lang's paper was on the subject of “The Early Development of Christian Latin as a Liturgical Language.” Fr. Lang began by detailing the history and development of Christian Greek and Latin and some of the inherent differences therein. As well, he gave a general consideration of the principle of sacred, or hieratic, language, including its history and its fundamental characteristics as inherently conservative and stylistically different from common linguistic use. One of the most interesting points of this talk hinges on this very point. While in some cases this idiom was the result simply of sacred language remaining fixed while common language developed, Lang points out that this was never the case with regards Christian Latin, which was highly stylized and thus never a part of the common, or vulgar, tongue in its usage. Lang further discussed the gradual movement of the Latin church from the Greek language to the Latin language which was to have an important role in aiding the Church in evangelizing the previously pagan Roman society, and particularly the aristocratic classes. But as Lang noted, making the assumption thereby that this was a concerted, principle-based effort to vernacularize the liturgy would be a faulty assumption as the liturgical Latin used would have been quite difficult for the average Roman to understand – not to mention those in Europe whose languages where not rooted in Latin, such as the Celts or Visigoths. Professor László Dobzsay teaches at the Liszt Ferenc Academy of Music and is a member of the Hungarian Academy of Sciences; he delivered a paper, “Music Proper to the Roman Liturgy”. Prof. Dobszay put forward a consideration of the place of the proper Roman liturgical chants and their role in the sacred liturgy. He began his paper with a comment that most scholarship with regards the liturgical reform has focused upon the Ordo Missae. However, he reminds, the Roman liturgy is not solely made up of the Ordo Missae but also is concerned with the question of the content of the propers of the liturgy, of the cycle of scriptural readings, of the Divine Office, and of the administration of the sacraments. It further pertains to the music of the Roman liturgy, particularly the chants of the Roman church, which is the ultimate focus of his paper. Dobszay analyzes the question in detail and argues that the chant is not a mere accompaniment of the liturgical rite, but a fundamental component of it for it has an important role in delivering the contents of the sacred liturgy of the day. In this regard, the proper chants are as fundamental to the Roman liturgy as are the other prayers and readings. Dobszay thus asserts that to exclude these chant texts actually has an effect of “mutilating” the message of the liturgy. The Rev. Dr. Alcuin Reid presented a paper on “Sacrosanctum Concilium and the Organic Development of the Liturgy” wherein he began with a pertinent call to all involved in the liturgical debates of the past few decades to move beyond simplistic, dated characterizations and assertions that would demonize either party and to consider anew the Second Vatican Council's call for organic development within the liturgy. Dr. Reid sets out to contribute to this task by examining Sacrosanctum Concilium, the Council's Constitution on the Sacred Liturgy, and further considers what authoritative commentators of the time took it to mean. These, he proposes, provide us with tangible and credible interpretive keys to resolving these questions. Dr. Reid proposes that the keys to understanding Sacrosanctum Concilium and its call for liturgical reform may be found within that document itself, laid out in the beginning of it as its general principles for the restoration of the liturgy. There do we find the familiar call for active participation in the liturgy on the part of the faithful. The primary means of this was not through an activistic interpretation, but rather is proposed particularly through the means of liturgical education for both the clergy and the laity alike. In reference to more specific liturgical reforms called for by the Constitution, the methodology of any reforms was also defined as being organic in nature, and where need for reform could be genuinely and certainly required, having carefully considered historical, theological and pastoral aspects. Reid is careful to point out that this created no controversy amongst the Council Fathers, and was even tightened up to ensure clarity in the manner of reform, which is credibly demonstrative of the fact that the Council Fathers did not understand this to be an open door for radical innovations, but simply prudent liturgical reform. Expert commentators of the time further confirm this conservative intention of Sacrosanctum Concilium, and prior to the voting upon the Constitution on the Sacred Liturgy, Reid informs us that the Council Fathers were assured that while there was a call for some reform to the Ordo Missae, that the Ordo Missae that had developed down the centuries was to be retained. To further clarify this, although he grants they are purely anecdotal in nature, Dr. Reid details his survey of the remaining Council Fathers, performed a decade earlier, many of whom confirmed the conservative intention of the document and of many of the Fathers of the Council. Dr. Reid concludes his paper with a critical thought about the liturgical positivism that has entered our time with regards to the liturgy and the exercise of authority. This resulted further in a principle of “organic progression” which allowed for a relativistic relation to the Roman liturgical tradition, reform within the context of organic development and ultimately with regard the Conciliar decrees themselves. Tangibly, it is a de-objectivization of the Roman liturgy in favour of a subjectivist understanding whereby we might form the liturgy as we think it ought to be, and in turn then give that subjective determination the objective weight of the tradition and of legitimate authority. He concludes that if we use the interpretative keys found within the conciliar document on the liturgy itself, as well as the interpretation of the experts of the time, and consider the testimony of the Council Fathers, it becomes a fair critique that organic development was not respected and thus it is only reasonable that the liturgical reform must be looked at again. Dr. Cristina Dondi of Lincoln College, Oxford presented a study on, “The Liturgies of the Military Religious Orders” wherein she presented her research on the Templars and the Hospitallers and their liturgical books. This study detailed their relation to the liturgy of the Church of the Holy Sepulchre in Jerusalem – which itself was, Dondi tells us, derived from a variety of Western sources in accordance with Latin usage at the end of the 11th century. She further explores variations in the local liturgical uses of these orders, including where they may have or may not have adapted to the local liturgical customs, festivals and uses., and their development in other locales, through the advent of the printing press, and beyond the Council of Trent. Dr. Lauren Pristas of Caldwell College, New Jersey presented a paper on “The Development of the Feast of Corpus Christi and its Place in the Church's Sacred Year.” In her paper, Dr. Pristas looks at the relationship between the celebration of the Lord's Day and the mysteries of the liturgical year from an historical as well as theological perspective, considering how the Church, through these, has and continues to present to us the mystery of our redemption. From this basis Pristas then examines the origins and development of the feast of Corpus Christi and draws that back to a theological consideration of its place within the Church's liturgical year and the illumination of the Paschal Mystery. Abbé Claude Barthe spoke on “Liturgical Catechesis in the Middle Ages: The 'Mystical' Meaning of the Ceremonies of the Mass” wherein he discusses the role and importance of the mystical-spiritual sense of the Mass, or in other words, allegorical interpretation of it. Fr. Barthe spoke of the mediaeval liturgical commentators and the patristic link to an allegorical or typological interpretations of the Sacred Scriptures. In this exercise, the mediaeval commentators look behind the letter of the liturgical ceremonial, art and architecture to arrive at the deeper spiritual symbolism to be found. In the course of his paper, Barthe lists examples of some of this commentary, as well as provides a useful summation of the major mediaeval liturgical commentators. Barthe in particular focuses upon William Durandus, the most substantial liturgical commentator of the middle ages, and his Pontifical and Rationale Divinorum Officiorum. From there he details the decline of this allegorical tradition in explicating upon the liturgy, particularly after the reformation and with the rise of Renaissance humanism. Barthe comments as well that this decline is paralleled by the rise of scientific criticism in relation to Biblical studies. This decline was completed in the twentieth century when such allegorical commentaries were near contemptible in status. Barthe is careful to not write off the development of scientific critique and the good and value that is found within them, but he is careful as well to distinguish as well between rationality and rationalism. There is a place for this scientific study, but as Barthe wishes to note, there is also a place for allegory, and a place for it to be taken seriously as a domain of liturgical study and inquiry. The Rev. 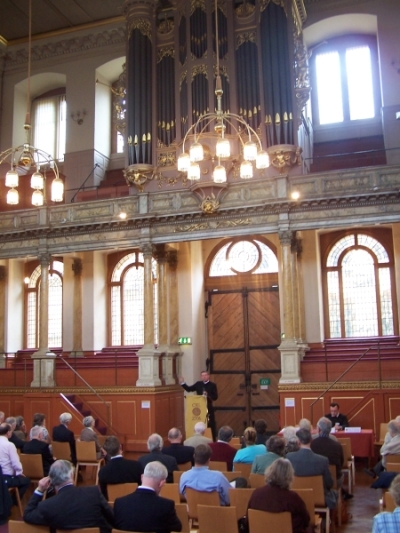 Dr. Laurence Hemming, Dean of Research at Heythrop College, University of London, and the Society of St. Catherine of Siena, gave the final paper of the Colloquium, hosted in the magnificent Sheldonian Theatre. Dr. Hemming's paper, titled “The Liturgy and Theology” examines this important relationship. Hemming sets out to demonstrate how difficult it is to elicit a genuine theology of the liturgy one hand, and further to enunciate where any such theology must come. Dr. Hemming highlights the importance the Second Vatican Council gave to the study of the sacred liturgy in relation to other disciplines, and notes the unfulfilled nature of this direction, whereby the liturgy would not only be studied in all its aspects, but likewise would other domains of theology relate back to their connection with the liturgy. Hemming argues that today its study tends towards an overemphasis upon its pastoral aspects, as well as considerations of the historical nature and relations of the texts without relating that study to actual practice and belief. However, what is especially missing from this are the other aspects mentioned by the Council: the juridical, the spiritual and the theological. The importance given to liturgical theology relates to the fact that it is central to all other theological disciplines. (A way of expressing this point might be that if theology is the queen of the sciences, then liturgical theology is the queen of the theological sciences). It is from liturgical theology that all other domains of theology proceed and are subordinate to. This is because, as Hemming puts it, theology has its home in prayer, in openness to God, and this is first and foremost found in the Sacred Liturgy, which is the Prayer of the Church. Dr. Hemming further considers the importance of a rediscovered philosophy of being which considers the world which surrounds one, analyzing the question in relation to the classical-mediaeval framework and the modern, and in relation to the rationalistic and historiographic approach to the sacred liturgy that has become dominant in practice. In the second part of his paper a very interesting point comes forth which he argues must be taken into account in any adequate approach to liturgical theology. The sacred liturgy is not so much to be immediately and universally intelligible (as is popular to say today) as though intelligibility were an end in itself. Rather, the liturgy is the means to intelligibility; the means, not the end, of coming to know God. As in the scriptures where we are told that we see now as only through a veil dimly, as now we have faith, but in the end we shall know, so too in the liturgy will there naturally be some incomprehension. In fact, Hemming argues that some incomprehension in worship is normal and even part of its character, and it has the valuable aspect of demonstrating our distance from God in our quest to become closer to Him. Dr. Hemming concludes his paper with his thoughts on some of the details of an adequate liturgical theology, which understands the liturgy to be centred around the Body of Christ and more basic even than the Scriptures or the Sacraments – being that through which they primarily flow. Finally as that (the sacred liturgy) which is truly sacred, and thus not arbitrary with regards to ourselves, for it is divinely ordained and that through which God's sanctifying power flows. Fr. Nicola Bux, a professor in Bari, Italy, presented “Theological Foundations of the Liturgy that are in Need of Restoration”. In his paper, Fr. Bux takes one through fundamental theological issues such as the presence of Christ at the heart of the liturgy. He continues his theological considerations of the liturgy by looking at the efficacy of the liturgy through grace and in relation to the sacraments. Significantly, he also gives an exposition of the various forms of participation in the liturgy. Throughout his paper, Bux identifies liturgical and theological aspects which he argues to be post-conciliar over-emphases that came at the expense of the Roman liturgy and its theological foundations. On a final note, Fr. Joseph Santos of Providence, Rhode Island, gave a talk on “The Rite of Braga” wherein he detailed some of the historical and liturgical specifics of that ancient Western rite. Moreover, Dr. Sheridan Gilley gave a talk on, “Roman Liturgy and Popular Piety”. At the time of the publication of this report, these papers were not yet available for summarization. As with all CIEL Proceedings, the present papers will all be made available in full and published in a handsomely bound volume so that the fruits of this liturgical research might reach outward beyond the Colloquium and into the hearts and minds of the bishops, priests, religious, seminarians and the laity. On October 22nd, the Clear Creek Monks had a fundraiser. Here are some online video clips of a few of the performances. This past Friday and Saturday, October 20 and 21, Professor William Mahrt [of Stanford University and president of the Church Music Association of America] conducted a chant workshop at St. Thomas Aquinas Cathedral in Reno, NV. About 26 people from Nevada, California, and Idaho attended. Professor Mahrt began the workshop by commenting that, for hundreds of years, people learned chant by listening and memorizing, since notation had not been developed. So, for the first hour, we learned several chants without any musical notation. Fortunately for us participants, this was not the rule for the entire workshop, but we did see an obvious difference when we went from singing by imitation to singing from notation: where initially we were singing a melody, and making the subtle changes in rhythm and intonation characteristic of a song, when we picked up the notated version, we immediately stated "singing the notes", that is, focusing on each individual neume rather than the phrasing of the verse as a whole. It was an illuminating experience. Professor Mahrt spoke at length about beauty: not only are the chants beautiful, but they bring beauty to the liturgy. In explaining some of the definitions of beauty that have come to us from St. Thomas and others, he showed how the use of chant not only elucidates the text of the verse, but its setting and employment at different parts of the liturgy can vary according to its liturgical function. Using the Psalm text "Justus ut palma florebit: sicut cedrus Libani multiplicabitur", he showed how different types of melodies allowed the same verse to be used as an Introit, an Offertory, a Gradual, an Alleluia, and as a regular Psalm verse. The differences in the melody and the use of melisma point up the different functions the verse is playing in the liturgy at that point: accompanying a procession of ministers, the incensing of the altar and the congregation, or as a call to mediation and attentiveness to the readings. The beauty of chant, when properly employed, brings us back to the sacred, and makes the liturgy more sacred. Chant is recognizable as 'sacred' music, even to those who do not know what it is, because of it "aims at something beyond", which Professor Mahrt explained was a phrase that a colleague of his always used. He also told many anecdotes in the course of the two days. One concerned monastic rules for pausing between the two 'halves' of a Psalm verse sung to a Psalm tone: some abbeys suggested the silent recitation of "Ave" between the two parts; others, "Ave Maria". A friend of his found the instruction, at St. Alban's, of saying "Ave Maria, gratia plena, Dominus tecum", which she was sure was a mistake, but on attending a service in that cathedral, found that the reverberation of the space required just that amount of silence between the verses. He also told a personal story of his background, and mentioned that growing up he never realized that anything except the "4 hymn sandwich" existed as a model for the liturgy until, as a music major in graduate school, he was told to learn all the chants for Holy Week to assist in the liturgies. This was the first time he had ever heard chant, and he remembers the occasion and the beauties of the chants to this day. The workshop concluded with the attendees singing for the Saturday evening Mass at the Cathedral. The propers for the 29th Sunday in Ordinary Time were sung for the Introit ("Ego clamavi"), Offertory ("Meditabor"), and Communion ("Domine Dominus Noster") from the Gregorian Missal, and the Ordinary for Mass XI (Orbis Factor) was used, with the substitution of the Gloria from Mass VIII (De Angelis). En suite rooms and standard rooms are charged at the same rate, on a first-come first-served basis. However it may be possible to reserve an en suite room for an extra charge of £15. We can offer a reduction £5 per day on rooms of any type to those who share their accommodation. Please note that rooms do not have air conditioning, and the Hall does not have wheelchair access. Accommodation is upstairs. All payments must be made in sterling. Bank details can be supplied on request. Payment by credit card is unfortunately not possible at this time. In 1996 the Centre for Faith & Culture organised a conference in Oxford on the "reform of the reform" movement within Catholic Liturgy. Its closing statement, the "Oxford Declaration on Liturgy", was widely quoted.1 The conference gave birth to a book, Beyond the Prosaic. Since that time, the movement to restore a genuine liturgical sensibility, spirituality and form has gathered momentum and authority. But there is still a burning need for people to be taught what the Sacred Liturgy is and why it is important. The Liturgy is not merely some kind of group event in which you sing a few songs, say some responses, listen to a reflection and go home. The vertical dimension of the Liturgy (and the Church herself) as containing at its heart the sacrifice of the Cross, joining earth to heaven. The sacrificial dimension of the sacred Liturgy, tied to a greater sense of the meaning of Holy Eucharist, the Christian priesthood, etc. The eschatological dimension of the Liturgy, as a making present of eternity in time, an actual drawing up of the mundane into the realm of the divine. The relationship of the external forms of the Liturgy to catechesis, to interior formation and disposition. The place of beauty, structure, symbol, cosmic orientation, language and music in divine worship. The Liturgy as something received, something objective, and not something we are can engineer. The essential role of tradition as a vehicle for the Holy Spirit and the organic development of liturgy and community. The intrinsic relationship of contemplation to action, of love for God to love for neighbour, in the Liturgy itself. The nuptial anthropology that makes Mass the consummation of a wedding between divine and human nature. Out of this course, with the experience of a beautiful Easter Liturgy, and some training in the use of the Divine Office and Gregorian Chant, will come refreshment of spirit and a renewed energy to serve God in the world. Recommended texts will be read privately and together during the first week of the retreat, which is dedicated mainly to prayer and meditation in preparation for Easter. More seminars will be offered in the second half of the retreat, as we unpack and deepen our experience of Easter. The main background reading for this course will be The Spirit of the Liturgy by Pope Benedict XVI (written as Joseph Ratzinger and published by Ignatius Press in 2000).2 A second important book for our reflection will be Jean Corbon, The Wellspring of Worship (Ignatius Press). Fr Corbon was a Greek-Catholic priest who contributed greatly to the writing of the fourth part of the Catechism of the Catholic Church, and his book is one of the richest meditations on the Sacred Liturgy available in English. Participants are advised to bring copies of both books with them on the retreat. We will also look at some other important short texts, especially the Mystagogy of Maximus the Confessor. Here the most important readings will be photocopied for those who do not possess them at the beginning of the course. They are, (1) “The Church’s Mystagogy”, pp. 181-225 of Maximus Confessor: Selected Writings, in the Classics of Western Spirituality series, and (2) H.U. von Balthasar, “The Synthesis of Three Acts of Worship”, pp. 314-331 of Cosmic Liturgy (Ignatius Press). See also The Christian Meaning of Time, by David Fagerberg (www.cts-online.org.uk/Deeper_Christianity.htm). Students will be encouraged to attend the Triduum Liturgy at the nearby Oxford Oratory, or the Orthodox Easter Liturgy on Canterbury Road. Vivian Boland OP, Master of Students at Blackfriars, Oxford, will be speaking in Holy Week about spiritual warfare, the subject of his forthcoming book in the CTS “Deeper Christianity” series. Stratford Caldecott, editor of Second Spring and author of The Seven Sacraments and Understanding the New Age (CTS) will be presenting and discussing material from his next book, The Twelve Gates: Entering the Liturgical City. David Clayton, artist and director of ResSource Ltd., will be talking about the role of the imagination in the spiritual life, and a new method for integrating the Daily Prayer of the Church with everyday life. David Fagerberg, a faculty member in the department of theology at the University of Notre Dame, is the author of The Size of Chesterton’s Catholicism and What is Liturgical Theology? as well as The Christian Meaning of Time (CTS). See http://www.nd.edu/~theo/faculty/fagerberg.html. Connie Lasher is the Director of the new John Paul II Center for Theology and Environmental Studies, at St Joseph’s College in Maine. See http://199.236.109.135/JPIICenter/director.html. Alcuin Reid is the author of one of the most important recent books on the liturgy, The Organic Development of the Liturgy, and the editor of Looking Again at the Question of the Liturgy with Cardinal Ratzinger, the proceedings of the 2001 Fontgombault conference. Adrian Walker is Associate Editor of Communio and formerly taught at the John Paul II Institute for Studies in Marriage and the Family in Washington DC. He currently lives in Germany. NB. For regular updates visit http://p203.ezboard.com/bsecondspring. Over at Second Spring, there is an interesting article that has been up by David Clayton, a man whom I had the pleasure to meet with while in Oxford. I was impressed by his deep and rich sense of liturgical architecture which put me in mind of the Eastern sense of the church building as a reflection of cosmological and theological realities; it also put me in mind of the great gothic cathedrals and what underlay them (for those interested in this, a great book on the topic is Otto Von Simson's, The Gothic Cathedral: Origins of Gothic Architecture and the Medieval Concept of Order), and it put me in mind of the task of AWN Pugin in his churches, wherein he tried (quite successfully) to reclaim a sense of the overall ornamentation of the Church, down to the tiled floors and walls. David Clayton's piece picks up on this theme and begins to develop it in the context of a proposal and way forward for a reclamation of such liturgical arts. The art of geometric pattern generally takes two forms (although most examples of abstract art contain elements of both): first, the representation of number as geometrical shape produces "hard" or "crystalline" works of art – examples of which would include the Islamic tiled patterns of the Alhambra and the Cosmati pavement in Westminster Abbey. Sometimes such designs are created as works of art in themselves, and sometimes as decorative borders around a piece of figurative art (and both forms of abstract art have been a basis for compositional design in figurative art). The second is "soft" or "fluid" art. This is calligraphic art – the art of line. As the artist draws, he uses the circular arcs of flexing joints in fingers, elbows, and shoulders to produce parabolas and eccentric curves. These are in fact graphical representations of mathematical functions that describe the order of the natural world. However, the artists who produced these shapes are not necessarily aware of this correspondence. This type of art tends to be more intuitive and less prescriptive than the other. We see this in Celtic illuminated manuscripts, in Islamic calligraphy and art based on "arabesques", in Chinese characters and in Baroque scrollwork. The beauty here is derived from an intuitive imitation of the natural order in the shapes of these curves. Baroque scrolls that appear in room decorations, picture borders, and picture frames are very abstracted, but nevertheless reminiscent of vegetation through the mimicry of growing vines with their twisting line and intertwinings, although this swirling decoration did develop into an overly ornate form in the later period. Unfortunately, it is this excess in the Rococo that in many people's minds typifies the Baroque and causes a negative reaction. What is commonly described as "Baroque rhythm" is the imposition of eccentric curves and parabolas upon natural form. The sculptures of Bernini particularly are criss-crossed with these curves, at times forcefully and deeply applied, at other times as subtle as lacework across its surface. Bernini used them to introduce interest and vitality and to draw attention to particular aspects of form in his sculptures by using the line to guide the eye.